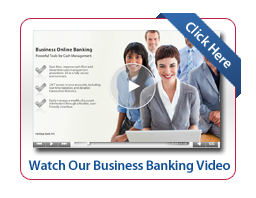 Business Online Banking and Business Mobile Banking are cash management tools designed specifically for businesses. Talk to your banker or contact us for more information. Customers have the ability to access information about their accounts with Heritage Bank through electronic means (Online Banking, ATMs, etc.). Although Heritage Bank tries to provide accurate and timely information to its customers via electronic means, there may be inadvertent technical occurrences beyond the bank’s control which would cause electronic access to be unavailable. Heritage Bank is not responsible for any losses resulting from the inability of customers to access their accounts and/or perform transactions during any such occurrences. Similarly, Heritage Bank is not responsible for any losses during periods when its electronic systems are shut down for maintenance, repairs, upgrades, or other necessary actions.